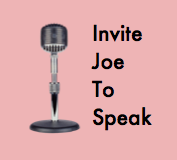 As Joe continues to get attention, his time dwindles away. But he can be available for speaking engagements. If you are a small holistic or health food business and you are in the greater San Antonio area and would like to reach out about special financial arrangements, or if you a sufferer -- or the family member of a sufferer of extreme obesity and need help -- feel free to contact Joe and explain the situation. Financial accommodations can be made.